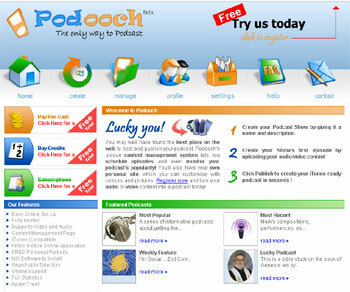 Sonique, a London-based technology company has launched Podooch, a website designed to let anyone create a podcast without the need for technical knowledge or specialized software. The site lets anyone with a web-connected computer upload a podcast or video podcast in minutes, and turn it into a podcast. The site gives users full management of their podcasts, from scheduling the release of new episodes to archiving old episodes. Other features of the site include a free month trial, unlimited bandwidth and disk space, a personal microsite, a content management system giving users the power to schedule the launch of their podcasts and full statistics of each podcasts so users can see how well their podcast is doing. According to Podooch, hosting is currently free. They plan to offer free and premium membership options next year.